There was this dead raccoon, in the road just ahead of my car. I didn’t see him until I was right on top of him. Swerve and hit another car, or run over him? I ran over him. He made a thud. It made me sick. I felt guilty too. Someone else would have stopped, done something. I just kept on going. I thought about my earlier experiences with raccoons as I drove away. Raccoons and I have had an intimate relationship…in the bedroom. A raccoon was in our attic and he hung out right over my bed, the one I share with Jerome, the Great and Good. It started with the sounds we heard. They were not the scampering sounds of squirrels; they were slow, plodding, deliberate sounds—diabolical sounds, if you must know. I tried to scare the raccoon away by banging a tennis racket against the ceiling. It didn’t work. We called an exterminator the next day and he came and set up a trap in our attic. I supplied the tuna fish. At three o’clock in the morning, Diabolical, his new name, stopped plodding and got himself caught in the trap. We knew he was trapped because he stopped plodding and started screaming. The exterminator took Diabolical to another place where he could crawl into somebody else’s attic. Or did he? Maybe Diabolical found his way to the Palisades Parkway on that fateful day when some other motorist killed him and I drove over him. 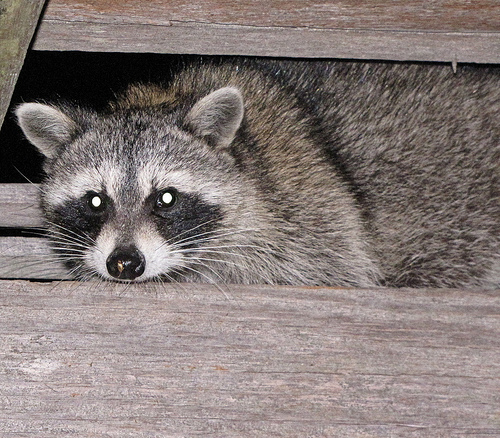 But the sounds of the raccoon…in my attic, in his cage and under my car— I can never get those sounds out of my head. Good story. I enjoyed it.